In the Midst of Winter shares ways to cope for those suffering from misunderstood chronic illnesses, and a glimpse into our daily lives for those who wish to understand. It also testifies of the Savior's ability to reach into each heart and bring hope and renewal. 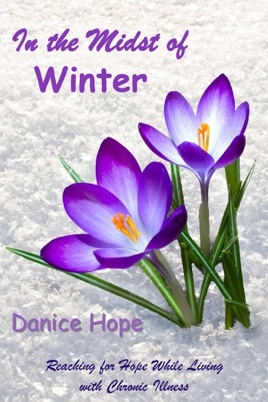 At age fourteen, Danice Hope started having troubles functioning during the winter months. Each year, the fatigue and depression grew worse. During the summers, her health would improve, and she learned to fit as much joy into life as possible before winter returned. After six years, she was finally diagnosed with seasonal affective disorder. Over time, she realized that there was also beauty in winter. She found a poster with flowers growing out of the snow that said, "In the midst of winter I finally learned that there was in me an invincible summer." In the mid 1990's, Danice moved south to Arizona with the hope of improving her health enough to have a better life. While the SAD improved, she found herself developing new health problems. The biggest surprise was that she could be sitting slumped over in a wheelchair in the emergency room, barely able to speak or move, and doctor after doctor told her that she wasn't ill, or that it was "just anxiety". After going to twenty-four different doctors in the next year, she was diagnosed with chronic fatigue syndrome. Stunned at the loss of her hopes and dreams, she gradually learned to see in new ways, to balance her health, to reshape her dreams, and to look to Christ. She learned that flowers can grow not only in the snow, but also in the desert sun.